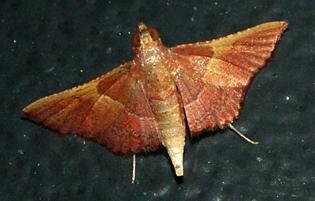 This moth is reddish-brown with a purplish sheen, with a pale-edged dark line parallel to the margin of each wing dividing it into two shaded sections. The wings are crenulated, and each has a slight recurve in the margin near the tornus. Tome 3, Part 2 (1793), p. 239, No. 416. Volume 58, Part 1 (January 2007), pp. 7, 11-14.